Happy Father's Day to all the father out there! Last weekend, hubby and I went on a daytrip to Shenandoah Nat'l Park. We hiked on my favorite trail called the Limberlost trail. We had awesome weather and saw great birds.. We also saw some deer, turkey and one black bear.. We took a picnic lunch and ate our lunch at the Big Meadows, always a pretty sight..
A view of the Shenandoah valley from the Skyline Drive in Shenandoah National Park. 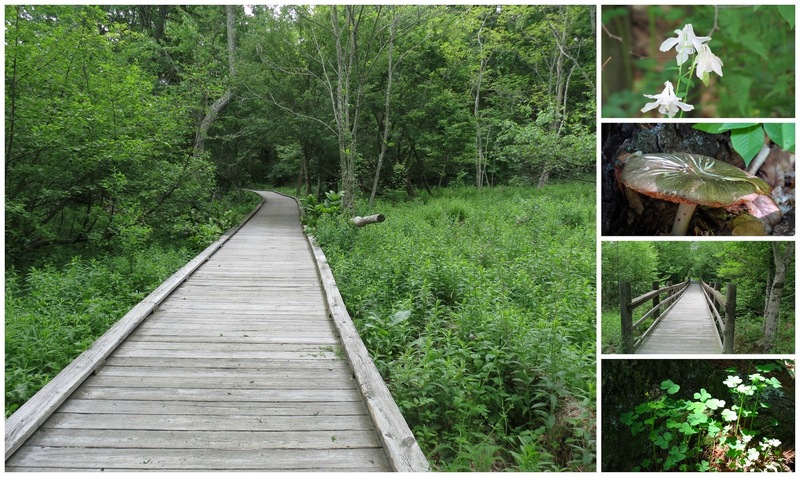 Some scenes from our hike on the Limberlost trail, the boardwalk, wildflowers, mushrooms and clovers. 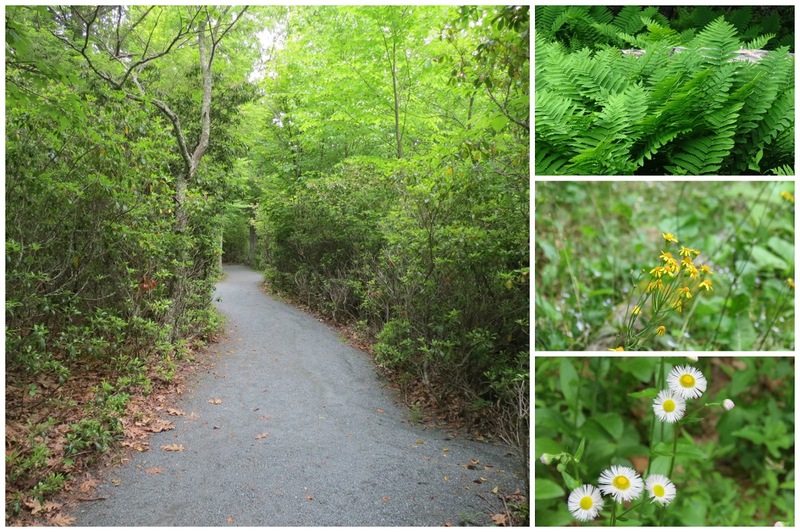 Scenes from my favorite Limberlost trail in Shenandoah..an easy 1.3 loop trail with gorgeous flowers and greenery..
More from the trail, these low growing bushes seem to attract the warblers, pretty ferns and some wildflowers.. These clovers? grabbed my attention, the shadows and lighting looked pretty to me. 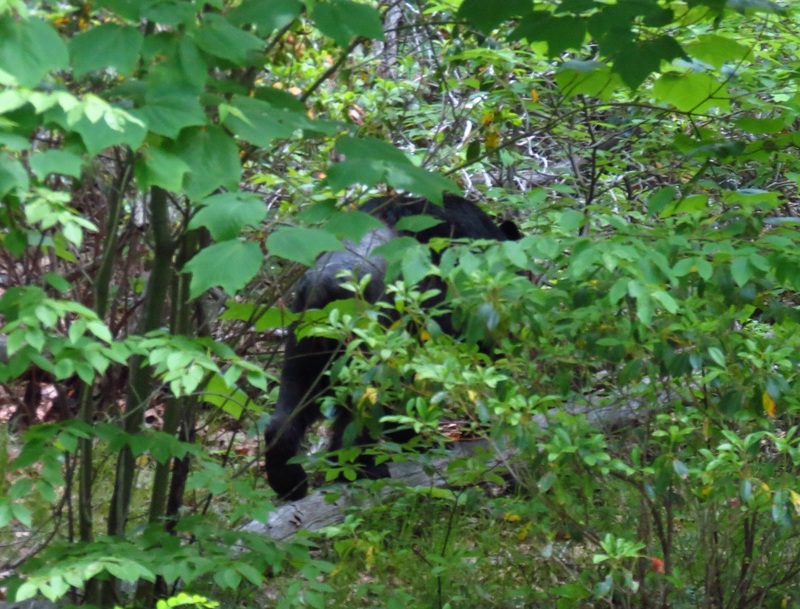 The only sighting of a Black bear, it had just crossed the Skyline Drive and walked into the woods as we drove by. Hubby and I had a great day, Shenandoah National Park is a wonderful place to visit.. Thanks to our host: Mary our host of Mosaic Monday and to the hosting group of Our World Tuesday: Arija, Gattina, Lady Fi, Sylvia, Sandy and Jennifer. I wish everyone a happy week ahead! the bear sighting is awesome! loved the ferns and those shamrocks. the tanager stole the show, though! Beautiful collages, especially the bear is great. Is that black bears are not dangerous? Perfect photographed, well done Eileen. Oh that view from the picnic spot is stunning. And as always I love your bird photos. 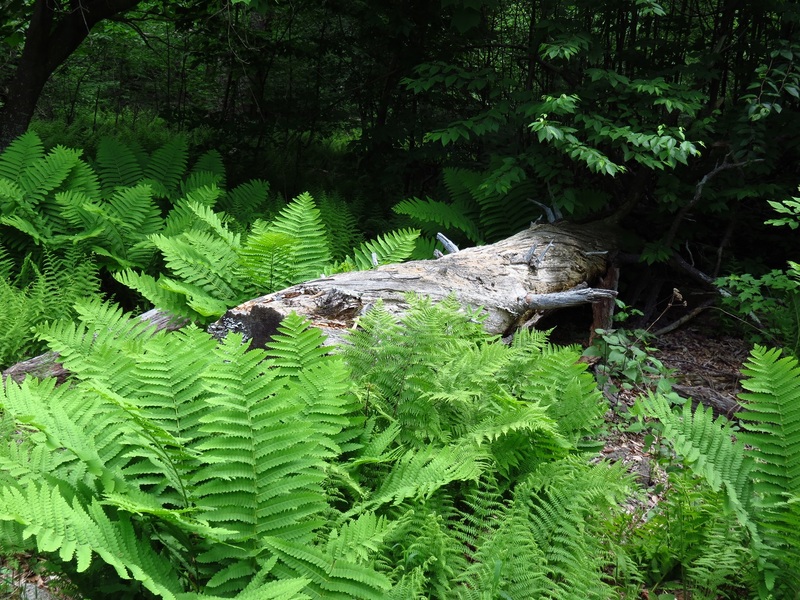 The ferns and other greenery along the walk are beautiful. Were you on foot when you saw the bear? It looked rather disinterested and seemed to be moving along in another direction. Great post, Eileen! What a wonderful place for a picnik! !Beautiful collage pictures! !The view is fantastic! !I like your birds shots and the bear!!Wow! !What a joy to see all those beautiful critters!! Wonderful photos . . . loved the views and oh my, the bird shots you manage to capture. Impressive . . .
Oh, I like that bear sighting! This is a wonderful post with beautiful photos. Oh, so gorgeous! I LOVE the Shenandoah! Beautiful pictures, and how neat having the brush with the bear! Such a wonderful place ! Your collection of photos is very impressive ! What a beautiful place. Thank you for sharing the photos. What beautiful photos and a gorgeous trail and park Eileen. I feel right at home as if I'm right there in that beautiful environment. Lucky you for the great birds you saw, and a bear! Holy smoke! What a super trip. Thanks so much for sharing! Great bear sighting. Love that boardwalk and the foilage, birds shots too! A pleasure to see some of the plants and birds (and that bear) on your walks/drive. Love the light on the clover. Every photo a visual treat. I so love the greens at this time of year. And your photos, of course! i will email ya. more info. Nice to live close enough to do that! Shenandoah National Park really is a beautiful and special place to visit, and your photos are a perfect reminder of why it is! This is the most beautiful area of the country that I have ever visited. I only regret that we only drove through and wish we had taken extra time on our trip to walk some of the trails. I love the Shenandoah Valley, but it has been a few years since I was there. Beautiful pictures! Stunning photos - I love the colors of all the birds. Some I've never seen. What a delight. Glad the bear was just passing through. Oh how we love that area....Wish we lived closer....You saw some great birds and got some great pictures... Love that trail. Beautiful national park with such lovely birds. What a pretty place for a hike. And so cool that you saw a bear! Thank you for sharing this. What a beautiful place to visit. We all need a place of beauty to relax and appreciate animals and nature. Your country is so beautiful, I guess you live in Virgina! Thank you for your nice words about Molly! Beautiful birds in a superb countryside. really beautiful mosiacs eileen!! you must come home with so many images!! 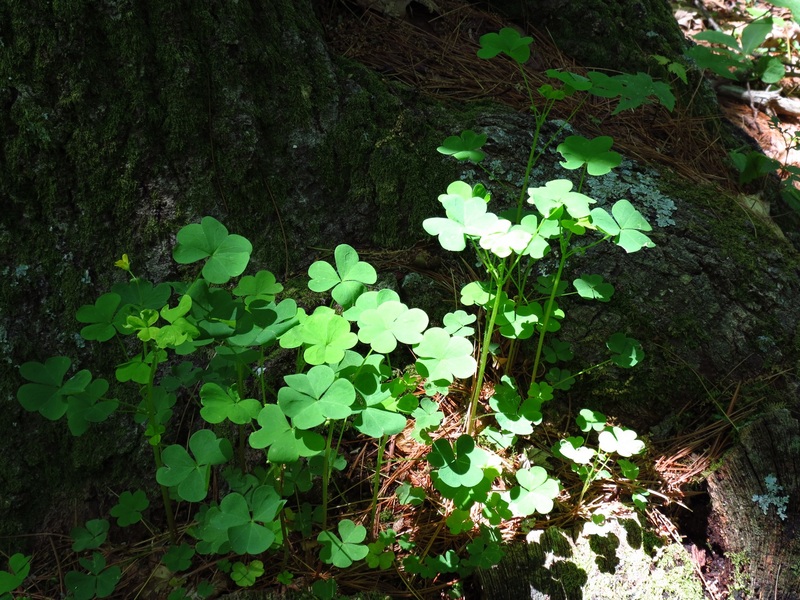 i thought the clovers were pretty as well with the light dancing across the leaves!! so cool to see a black bear in the wild, where they belong and are hopefully left alone!! Eileen-you always take such great photos-but I gotta say, that top one is STUNNING . What a spot-you captured it beautifully. So much beauty, birds and bears! What a beautiful place!!!! Lucky you can enjoy it! Your photos are superb, as always! Wishing you a happy new week!!! Beautiful photos of the birds, and the fern looks so refreshing to see on a hot day! What a beautiful park, Eileen! And your photos are superb as always!! They are the next best thing to being there myself! Thank you so much for sharing the beauty of your world! Hope you have a great week!!! Enjoy! What a wonderful place to visit! Great collages, Eileen. Wonderful place to explore. Great sequence of shots. Gorgeous views! Love the Tanager! The Shenandoah Mountains are certainly beautiful. I've been there a couple of times. That is so beautiful - and as close as you want to get to a black bear in the wild! We've enjoyed each and every visit we've made to Skyline Drive and the Shenandoah National Park. 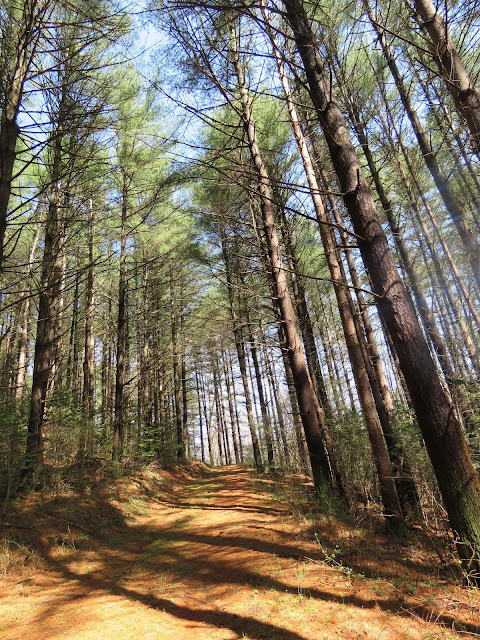 We've never hiked the Limberlost trail -- we'll have to rectify that on a future visit. Eileen, What a lovely post. Your collages are very pretty. How exciting (and scary) to see a bear! Lovely! I have never come across "Veery" before. Good to learn something new today. Love the ferns too. What a beautiful landscape and bird pictures ! My husband and I drove along Skyline Drive a few times in the past, Eileen ,and loved the beautiful views for up there! Did you ever visit Luray Caverns? The Scarlet Tanger is such a gorgeous bird! 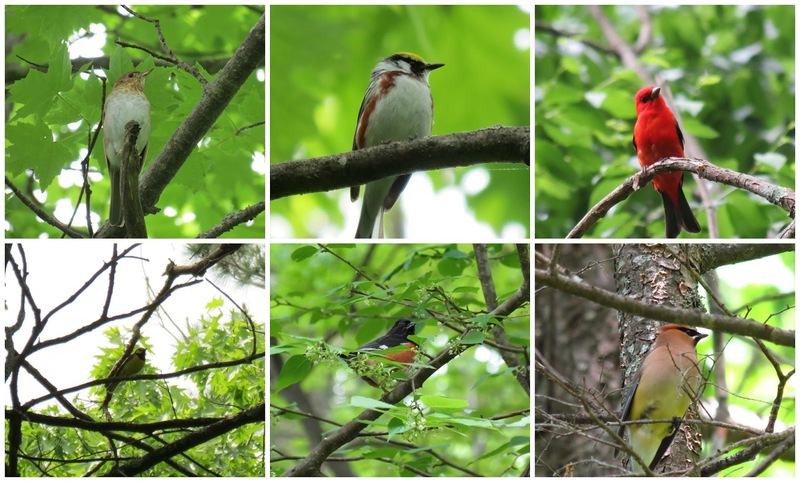 You have a good eye to see all these birds in the trees. Great series!! Boom, Bobbi and Gary. O lugar é bonito para um passeio! e você captou lindas imagens dos pássaros e animais! The view of the valley is stunning! 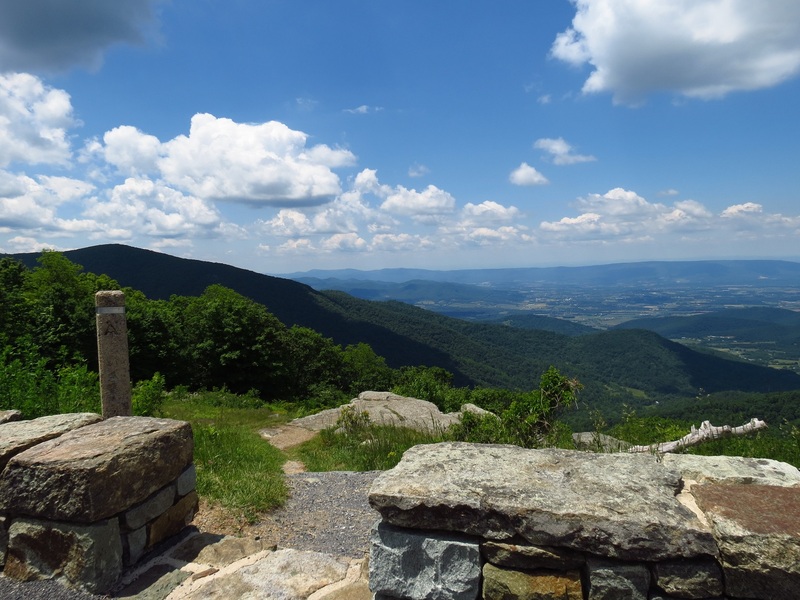 I'll be putting Shenandoah NP on our to-go-to list! :) Beautiful birds, most of which I've never seen other than in photos. Gorgeous walk! 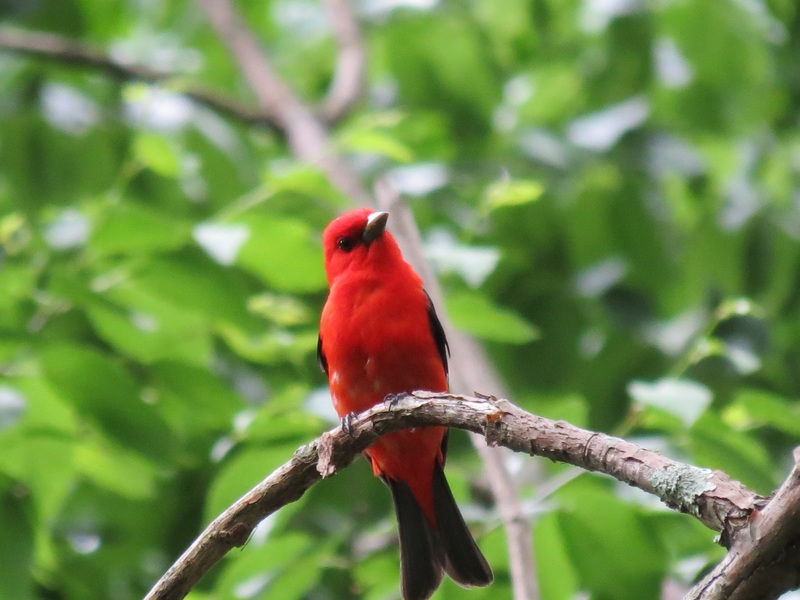 Love that Scarlet Tanager! Beautiful shots!!! I really like that little red bird. I hope to get to Shenandoah this year. It has been awhile.